Now if you are not yet convinced on why you should quit, then, here is another reason. Smoking causes brain shrinkage. Yes! Aside from it causing lung cancer, stroke, and decreasing lifespan, it damages your brain too. Prolonged cigarette smoking can thin your brain’s cortex. This plays a major role in your brain functions such as language, memory, and perception. In addition to that, smokers have a higher risk of getting Alzheimer’s disease. Quit NOW for a healthier you! Excessive alcohol is the main culprit for liver diseases. But do you know that it also causes brain damage? In fact, it destroys connections between the brain cells. Blurred vision, difficulty to walk, impaired memory, and poor decision making; these are just some of the bad effects of alcohol on a person. You probably had these symptoms the last time you get drunk. Too much alcohol over time can lead to brain shrinkage, loss of memory, and Wernicke-Korsakoff syndrome. Drinking liquors are completely fine but make sure to take it moderately to avoid health issues. Your brain’s main function is to think. And when you don’t, then your brain size will decrease. Reading, writing, and solving crossword puzzles are some of the activities you can practice to exercise your brain. Another way is through downloading and playing brain games. Paint and unleash your creative side. Don’t stop thinking and learning new things every day. No man is an island. Every one of us has our own sets of friends and even an introverted person still have one or two. Being alone cause stress which is not good for the brain. Go out and socialize! Talk to your friends and meet new people. Engage yourself in intellectual conversations that can boost your brain’s capacity. As much as possible, opt for face to face conversation rather than just talking through your phone or social media. It helps to further develop your brain. Whether you’ve checked out one or two items from the list above, don’t fret. 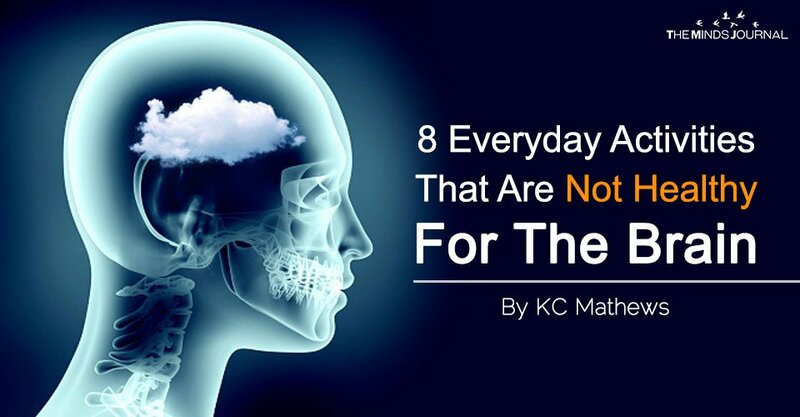 You may start protecting your brain’s health through these tips. Sleep as much as 8 hours a day. Give your body and brain a rest. Stay active. Exercise both your brain and your body. Eat healthy. Avoid overeating and stay away from junk foods. Spend time with friends and family. Don’t always lock yourself at home. Minimize your sugar intake. Time to cross out those candies on your grocery list. Take vitamins and supplements for the brain. You may ask your doctor about it. Quit smoking! You don’t want to die early, do you? Drink liquors moderately. Besides being dangerous to your health, you’ll get into trouble a lot. Drink plenty of water. Easier said than done but its benefits for overall health is astounding. Take a rest when you’re feeling under the weather. Don’t force yourself to work. Stop skipping breakfast. Change your morning routine immediately. Think positively. Avoid worrying too much. Your brain always does the thinking but when was the last time you actually thought of taking care of it? Well, you can always start NOW. Get rid of these dangerous habits and you can definitely prolong your life.